In 1890 a meeting was held between Reverend Paul O.F.M of St. Joseph’s Parish Chatham, Reverend Mother Ignatia Campbell, and Mother Aloysia Nigh, along with some of the prominent doctors of Chatham. They decided that the community was in need of a hospital and the sisters agreed to run it. A boarding house, formerly the Salvation Army Barracks, was leased until funds could be secured for a new hospital to be built. 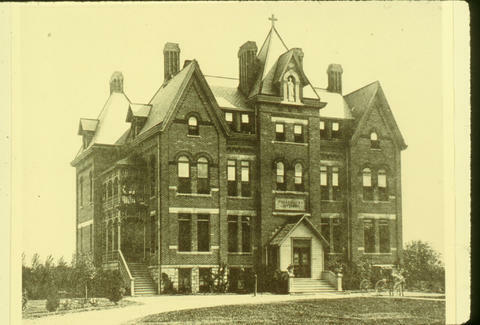 The hospital was officially opened in its temporary quarters on October 15, 1890 with Mother Aloysia as its head, assisted by Sisters Francis and Martha. Construction began at the hospital’s long-time site of 519 King Street West on the Thames River with the laying of the cornerstone in 1891. Construction was completed in 1892. Over the years, wings were added onto the hospital to accommodate the growing community of Chatham and, therefore, the growing demand for hospital services. In 1972, the amalgamation of services occurred between St. Joseph’s Hospital and Public General Hospital as ordered by the Ministry of Health for financial reasons. Legislative changes, increasing government control, and the decline of Sisters in the health care field led to the gradual withdrawal of the Sisters from the hospital. The last year that a sister was a hospital administrator was in 1984. In 1992, the Sisters withdrew from residence at the hospital, and in 1993 the ownership of the hospital was changed over to the St. Joseph’s Health Care Society. The fonds consists of essays, annals, a memoire, correspondence, memos, minutes, reports, financial papers, newspapers, newspaper clippings, photographs, drawings, floor plans, fact sheets, orientation booklets, bylaws, yearbooks, speeches, programmes, invitations, cards, newsletters, posters, flyers, press releases, membership roll, and certificates. The records were transferred from the Sisters in Chatham to the Congregation of the Sisters of St. Joseph in Canada - London site archives. F06-S002 Correspondence and F06-S006-03 Crisis Fund Campaign 1972 are restricted to the public. A. Doyle (ed.) and J. Williams (ed. ), St. Joseph's Hospital 1890-1990: Share the Journey, Chatham, Ontario, 1989. G. J. Humbert (ed. ), A Compendium of the Catholic Health Association of Canada, 2011.